This little chapel was build in 1671 by Giovanni Giacomo Ravelli. All people in the Netherlands with the surname Ravelli are descendants of this man. The Family Ravelli Foundation in the Netherlands ordered in 2014 the restoration of this chapel. The restoration was completed in 2015 and inaugurated in oktober 2016. The life of Giovanni Giacomo Ravelli. 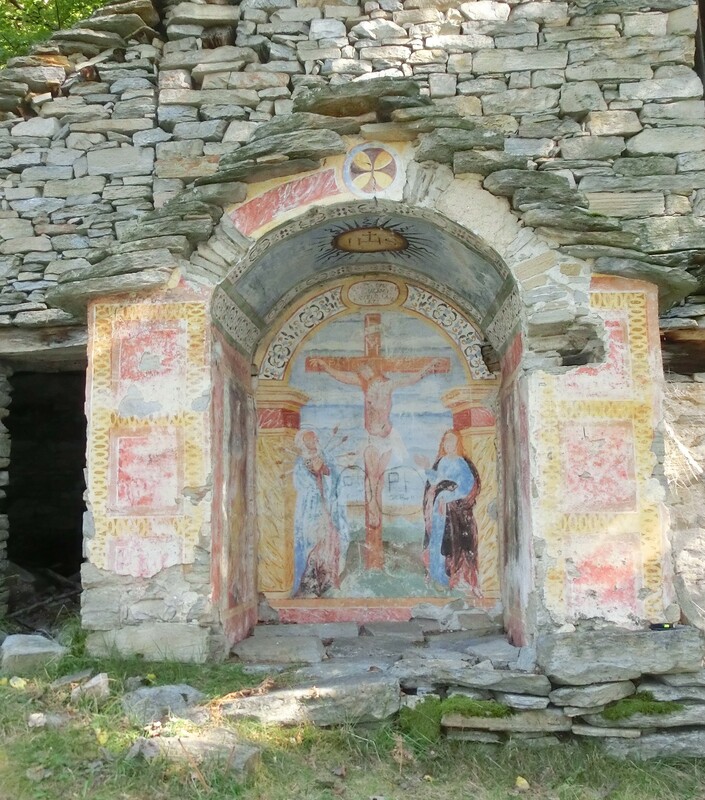 It is possible that Giovanni Giacomo was born in the baita to which the Chapel is attached. 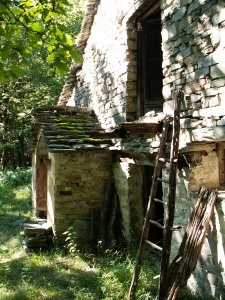 According to the current inhabitants of the Valley Vigezzo the cattle came back from the mountains around 20 September. It is obvious that Anna Maglini, the mother of Giovanni Ciacomo was in the baita when she gave birth to her son on 15 September 1601. Seventy years later he built the Chapel to prise the Lord. After this inauguration Giovanni Giacomo lived for another five years. He died in January 1677. Giovanni Giacomo lived in a period that was typified as the small ice time. This period lasted roughly from 1600-1850. Everywhere on the Northern Hemisphere average temperature was 1-2 grades lower than at the end of the twenties century. During this period there were many extreme cold winters. It is not said that every year it was cold. The years 1636 and 1337 were extreme mild with beautiful Wine harvests as a result. The relative cold periods and the consequences on the healthiness of the population in North Italy must have hurt the life of Giacomo Giovanni and his family. Yet he was fortunated. Seven of his nine children lived relatively long. Six of them had offspring. Plenty reasons to show his gratefulness towards the good Lord by building a Chapel. 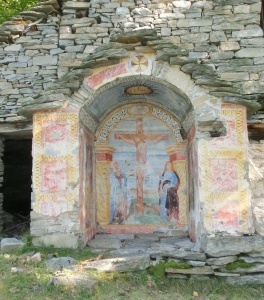 The most striking is the Fresco on the backside wall. We see Jesus on the cross with Maria and Johannes. On the background we see a hilly landscape. 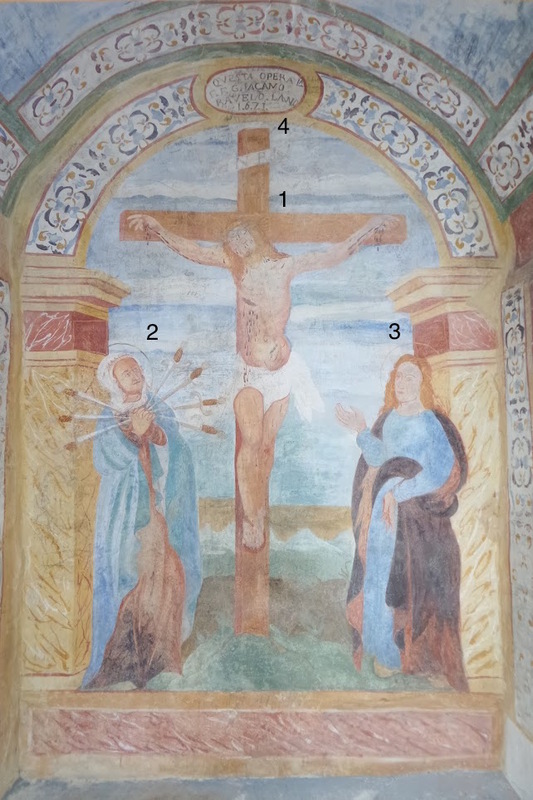 In the gowns of Maria and Johannes we see the colour red in referring to the suffering of Jesus and the spilled blood. 1. Central is the image of Jesus on the cross of Golgotha. The painter here marks the moment upon which Jesus says to his mother: See here your son. To Johannes he says: see here your mother. 2. Maria is pictured with seven swords through her heart. This way of picturing is known as Martha with the seven swords (our Lady of Sorrows). Each sword stands for the pain that she had to endure. 2a. When Simeon predicted in the Temple the suffering of Jesus and the Liberation of the sins and Jesus said to his mother: “Your soul too will be pierced by the sword”. 2b. When Maria and Joseph had to flee for Herodes who wanted to kill Jesus. 2c. When Jesus at the age of twelve was missing, his parents finally found him in the Temple. 2d. When Maria sees Jesus carrying the cross. 2e. When Jesus spoke the words: ‘Woman, here is your son’. 2f. When Jesus was taken from the cross. 2.g. When Jesus was laid in his grave. The memorials of Maria of the seven sorrows takes place on 15 September and is devoted on the smart and suffering of Maria. 3. On the right is Johannes. This disciple represents the whole humanity. By the words of Jesus on the Cross Maria is not only the mother of Jesus but of everyone. 4. Above the cross is a reference to the builder of the chapel, G. Iacomo Ravelo. We know that this refers to Giovanni Giacomo Ravelli because this is the only one in the village that reached the age of seventy in the year 1671. 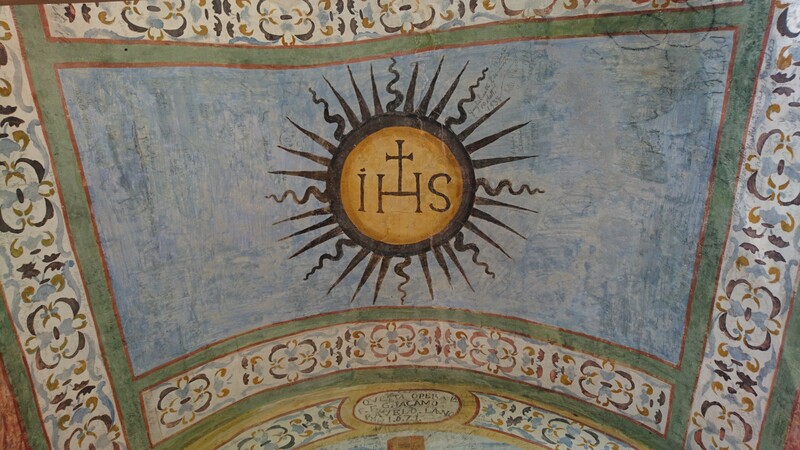 Not only the image of Jesus on the cross proves that Jesus was important for the builder, but also the monogram on the ceiling with the characters IHS and the Nimbus above the facade of the Chapel. The monogram show the first 3 Characters of Jesus in Greek Capital letters (IHΣOΣ): Iota , Eta and Sigma. 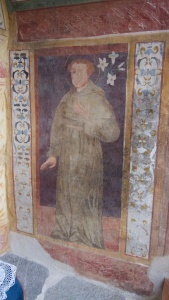 Bernardus of Siena was very important for the religious revival in the 15e century. In his preaches he used the monogram IHS. He was often accused of witchcraft, but never condemned. 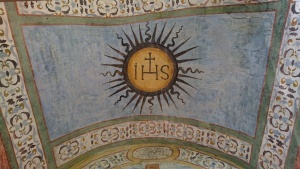 Finally Pope Martinus V authorized the use of the monogram under the condition of the use of the cross on the capital H.
The brown circle above the facade of the Chapel refers to the aureole of Jesus. This aureole is called the Nimbus cross. At the right wall we see Saint Jacob referring to the name of the contractor. This Saint can be portrayed in different ways: as martyr, as knight or as Pilgrim. Here he stands as Pilgrim. Saint Jacob can be recognised in the first place to his aureole. Apart from this on the various portraits additional attributes can be found, such as: the habit, the cloak, the pastoral staff and his bare feet. The symbol of Saint Jacob is the scallop which isn’t shown here. 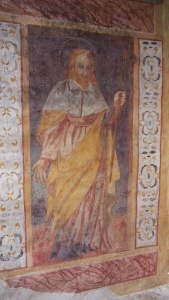 At the left wall is Saint Anthony. We don’t know why he is pictured so prominent on the left wall. Some people told us that he was an idol in the Seventeenth century. 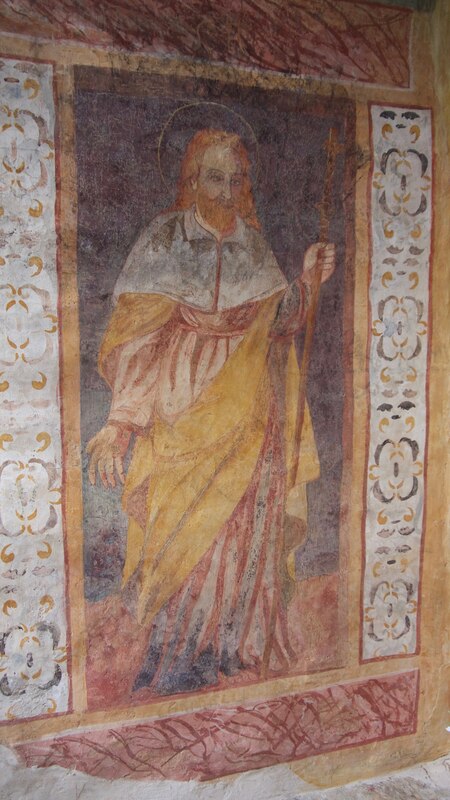 Anthony is the Saint of the Franciscan, lost objects, wives and children, the poor, bakers, mineworkers, the matrimony, the travellers and lovers. He is also Patron forth shipwrecked, the black Plague and fever. In the family of Giovanni Giacomo the names Antonio and Antonia are common. Possibly the portrait of Saint Anthony is a tribute to the mother of his wife of whom we only know the first name Antonia or of his grandfather Giovanni Antonio Maglini. Together with the aureole Antonius is often portrait in a brown habit, a book upon which Jesus is seated and a lily. This white flower refers to the pureness of his preaches and sexual moral. 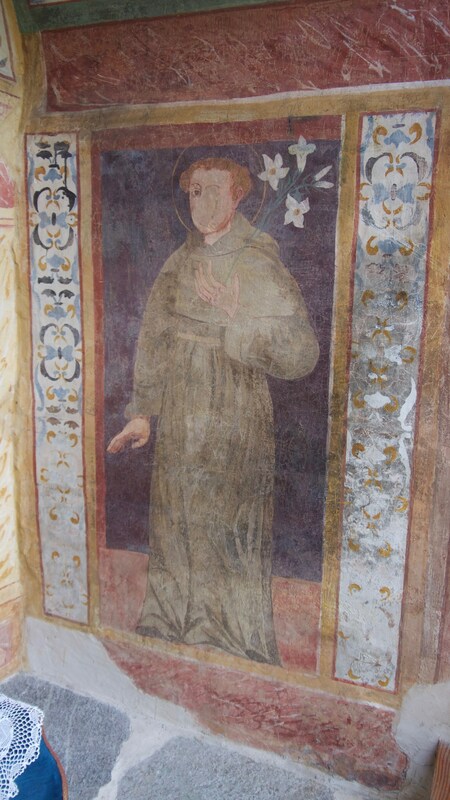 On the Fresco in the Chapel we recognize Anthony by his brown habit and the Lilies. The book upon which Jesus is seated was not portrayed. Most probably we will never know if and in what circumstances the chapel was consecrated. However, we presume that this was done. Giacomo Giovanni was born on September the fifteenth, the day Maria of the sorrows is memorized. That is why we assume that on Friday 15 September 1671 the Chapel was inaugurated. We don’t know what the weather was that day. Likely it was not cold. Perhaps the sun was shining. Most probably the vegetables were collected and the bees had already produced their honey. Also the time of the blueberries was left behind. The mushrooms grow in abundance. Autumn is nearby. Soon the apple and pears can be harvested. Also the chestnuts must be mentioned. It is a period of abundance. It may be that a Mass was read in the Church San Michele in Albogno. Perhaps the Pastor went directly to the Chapel. Most likely the inauguration was at the end of noon, when most of the work on the field was done. Almost sure there were many people. On that very day his wife to who he was married already 47 years was still lived. Their seven children would have been present, some of them with their partner. Lucia with her husband Giovanni Maria Allesina, Antonia with her husband Giacomo Gulielmi, Anna with Giovanni Maria Andrioli, Giovanni Giacomo with his wife Mattea Andrioli, Cattarina with her husband Nartolomeo Minetti. Besides the children there will have been many grandchildren. By that time still eleven grandchildren were alive: Antonio Andrioli, Maria Andrioli, Elisabet Andrioli, Giovanni Antonia Alesima, Anna Alesina, Giovanni Giacomo Ravelli, Bartolomeo Ravelli, Maria Ravelli, Pietro Antonio Ravelli,Guiseppe Maria Ferrari and Silvestro Fransceso Ferrari. Most probably other relatives and friends were present. In short when the Chapel was baptised on 15 September 1671 we may assume that there many people.